aka “Sims 2 Ghost Colors”. The Zero Event for the plot of StrangeTown Monty. Originally a standalone, the “story” is not immediately obvious because I presented it as a documentary (scroll down after the video for the “Ghost Colors Game Guide”). It was only much later that I decided to turn the last 30 seconds of this video into an entire series. In other words, the rest of the series is different from this “Episode Zero” because they have Simlish voices and a clear story. OLD AGE: An Elder sim reaches the natural end of his/her lifespan. If their Aspiration level is Platinum at the moment of death, they leave behind a nice “golden” tombstone/urn with their Aspiration symbol on it. If it is Gold & below, they leave an ordinary gray grave. There are two Old Age death animations: Hula Dancers (Gold, Platinum) & Hourglass Struggle (Green & below). FIRE: Remove all fire alarms and sprinklers in the room. Set an object ablaze, and hope the nearby sims catch fire. Once their needs are completely drained, they die. The easiest ways (1) A sim with very low Cooking skill leaves toaster pastry unattended for long enough (2) build an enclosed room with lots of flammable objects, with a lighted fireplace / neglected oven food / a few nightclub fire spurters. DROWNING: A sim drowns easily while swimming with their Energy bar close to full Red. It is easier if you remove all the ladders from the pool. STARVATION: Don’t feed your sim, and their Hunger motive drops to full Red. This can also be achieved by turning off Free Will and leaving your sim unattended. The poorly-crafted, green-smoke-emitting Snapdragon Bouquet (OFB) can deplete the needs of sims near it, causing death by Hunger. Witches/Warlocks who sit on Thrones of the opposite alignment (AptLife) will have all their motives depleted in a similar way to the evil Snapdragon Bouquet. Their Hunger motive may drop to full Red as a result of this. Children, toddlers & babies cannot starve to death. They are taken away by the social worker if their Hunger motive drops to full Red. ELECTROCUTION: A sim with low mechanical skill attempts to repair electronics when their needs are low. If the electric shock depletes 3 of their motive bars, they die. FRIGHT: A sim with low needs gets spooked by a ghost. If the scare depletes 3 of their motive bars, they die. In the Nightlife expansion, a sim with low needs who peeks on a sleeping vampire also risks dying by fright. FLIES: Have lots of fly-infested dirty dishes (12-15) in the same room. There is a random chance that flies may engulf a nearby sim. DISEASE: Sims randomly get sick when coming back from work/school, or when they use the Science career reward with low Logic skill. Don’t cure your sim’s sickness for 7-10 days. No medication, no sitting or sleeping. Note that some diseases are contagious, so if you are not careful, your sick sim may accidentally spread an epidemic through your neighborhood. SATELLITE: Keep your sim “Watching clouds” (day time) or “stargaze” without telescope (night time), for a random chance that a satellite may fall on them. There’s no *guarantee* of WHEN it’ll happen. It depends on how (un)lucky your sim is. COWPLANT (University): A sim who tries to “Grab Cake” from a Laganaphyllis Simnovorii (cowplant – career reward for Natural Science) will get eaten if their Hygiene motive is NOT TOO low. Your controllable sim family will not autonomously “grab cake”, but visitors will. If you’re entertaining guests that are not meant to be cowplant fodder, lock up the cowplant in a room, put it into your inventory, or “Feed” it with a hunk of meat so that its cake tongue disappears temporarily. VAMPIRE SUNLIGHT (Nightlife): A vampire sim is exposed to sunlight for too long, causing enough of their motive bars to deplete. RALLY FORTH (Open for Business – OFB): You need a sim-owned Business with at least Rank 5 to unlock the “Rally Forth” Motivation Perk for the business owner. When you use the “Rally Forth” interaction on yourself, you sacrifice your needs to replenish the needs of everyone else in the room. A sim dies by Rally Forth when they use the “rally forth” interaction when their needs are too low. 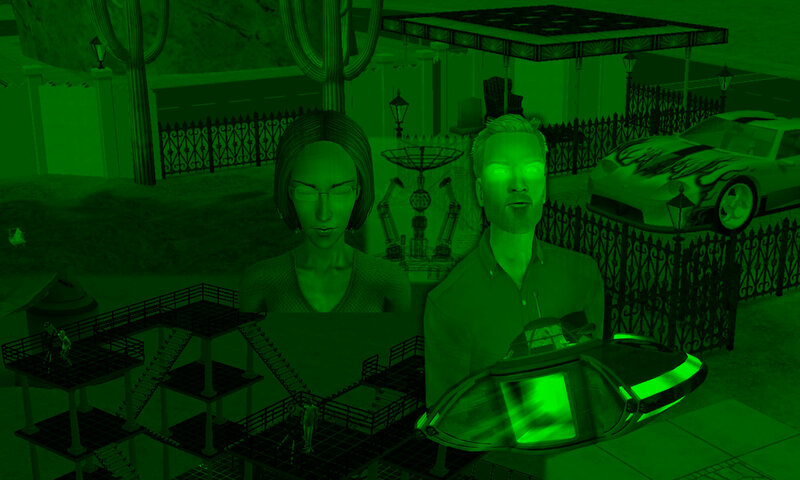 The “Rally Forth” perk may be passed from the business owner to other sims in their household. The sim who teaches the perk does not lose the perk themselves. KITE (OFB): Get a toymaking bench, build your toymaking badge to Silver, to be able to craft kites. If you choose “make many”, you will get a mixture of good colorful kites (which are safe to fly) and some evil white kites (which can electrocute your sim, & fatally if their mood is too low). LIGHTNING (Seasons): A sim with low needs gets struck by lightning. The chances of a lightning strike are higher if the sim is in water. HAIL (Seasons): A sim with low needs stands outdoors in a hailstorm for too long. MURPHY BED CRASH (Apartment Life): When a sim with very low needs (esp Energy) and very low Body skill tries to “open” a Murphy Bed, there is a random chance that it may crush the sim to death. ELEVATOR CRASH (OFB / Apt Life): An elevator crash is more likely to happen with a poorly repaired cheap elevator. If the sim riding in a doomed elevator has low needs, they may die as a result of the crash. SCISSORS (requires custom download): “Running with scissors” can cause a sim’s death, especially when their motives are low. I didn’t have this download at the time I made the “18 Ways” video, but downloaded it here for Strangetown Monty 1.05. – Some of the ghosts look like they “died again”. But they are actually only *re-enacting* their deaths, & such animations are only available for some death types. – Ghosts come out around 8.20pm & disappear around 6.20am. The more graves you have on the lot, the more likely you’ll have a haunting each night. In most cases, the sim has to be dead for a few sim days before its ghost comes out. – The only time a ghost comes out during daylight hours is when lightning strikes a tombstone (Seasons EP). The ghost hangs around for a shorter time than in the usual night hauntings. – If you have the Nightlife Expansion, and you move graves to a community lot, the ghost colors will ALL be reset to transparent. Community lot ghosts do not haunt the whole night long like their counterparts in residential lots. If you move such graves back to a residential lot, they will all be treated as Starvation ghosts.